Home > Products > Ten Strawberry Street Monaco Silver and Gold Glass Charger Plate 13"
Use the Ten Strawberry Street Monaco Silver and Gold Glass Charger Plate 13" to provide your specialty dishes with a sophisticated and elegant backdrop. Defined by its charming, intricately-detailed design, this glamorous charger boasts elegant artistry perfect for lavish parties and formal dining settings. 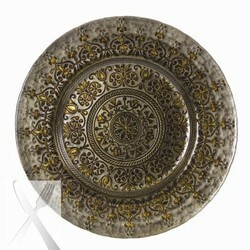 The gorgeous combination of silver and gold easily complements any table decor and upscale dinnerware. Thanks to its solid glass construction, this premium quality charger plate combines a delicate appearance and unbeatable durability. The perfect harmony of aesthetics and function, this gorgeous charger prevents spills and mess. For proper care and maintenance, hand washing is highly recommended to retain its luster.